Morrisville Borough offices are located at 35 Union Street, Morrisville PA 19067; phone: 215-295-8181. Related page: History of Morrisville. Morrisville Borough was incorporated in 1804. It's significance precedes this date in areas of both industry and politics. Robert Morris speculated in land and buildings and planned to convince Congress to "site" the Nation's Capitol at the "Falls of the Delaware." To this task he invested prodigious energies, enlisted a considerable number of supporters, and almost succeeded. Located directly across the Delaware River from New Jersey's state capitol, Trenton, Morrisville occupies a strategic location near the center of the Boston-Washington D.C. corridor. Easy access to rail (SEPTA, NJ Transit & Amtrak) and highways (US 1, I-95, & NJ Turnpike) makes for convenient commuting to New York City, Princeton, Philadelphia, and points in between. Borough homes consist primarily of detached single family residences and twins (semi-detached). There is one significant townhome subdivision, Cambridge Estates (sometimes known as Cambridge Crossing). 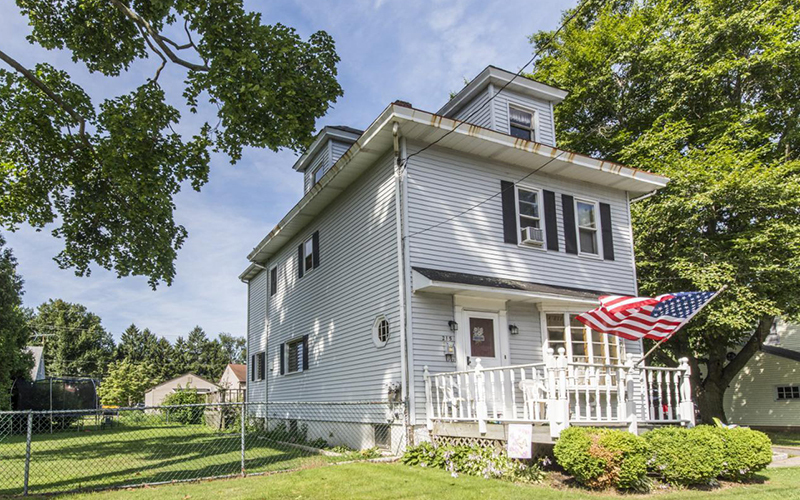 Homes for sale are typically from the early 1800s with some constructed as late as the 1990s. Most of the homes were built from the 1920s through the 1950s. Principal neighborhoods: Capitol View, Highland Park, Manor Park, Morris Heights, "The Island," and Washington Heights. Resident interviews conducted for the bicentennial celebration revealed many interesting insights to boro life: the fact that one neighborhood, "The Island" was simultaneously home to four generations of a single family. In fact, a notable number of residents who have called Morrisville "home" for more than half-a-century are found throughout the boro. While the borough and school tax "rates" are the highest in southeastern PA, this is somewhat offset by the fact that residents are not levied the 1% earned-income tax that is found in most other municipalities within the region. The borough is home to four separate properties that appear on the National Register of Historic Places, including "Summerseat" which is also a National Historic Landmark. Morrisville is a pleasant borough, with 405 inhabitants, opposite Trenton. The bridge over the Delaware, connecting it with Trenton, is 1100 feet long, and consists of 5 arches. The arches are of wood, and are above the level of the road-way, which is suspended from them by means of iron rods. Morrisville took its name from Robert Morris, the financier of the Revolution, who resided here some years, in a house that was afterwards occupied by General Moreau, of the French revolutionary army. The 'wood-arch' bridge referred to above was destroyed by fire. The current iron bridge, known as the "Calhoun Street Bridge," is on the National Register of Historic Places.